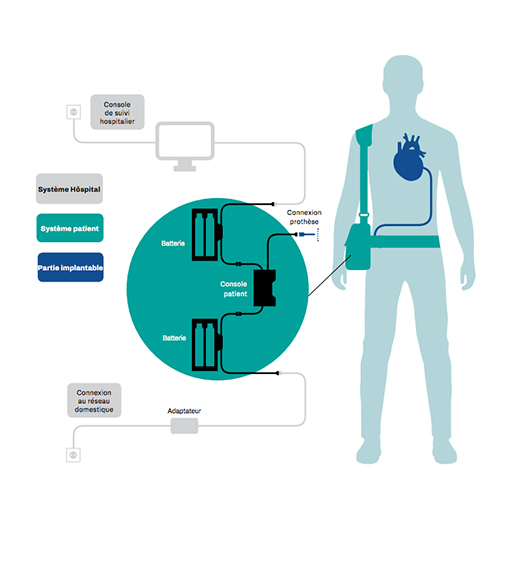 CARMAT (FR0010907956, ALCAR), the designer and developer of the world’s most advanced total artificial heart, aiming to provide a therapeutic alternative for people suffering from end-stage biventricular heart failure, today announced an update on its clinical progress and recent developments, as well as its cash position at December 31, 2018. The interim analysis concerned the 10 patients of the first cohort of the PIVOTAL study, the first of whom was enrolled in August 2016 and the last in July 2018. Altogether, the study foresees the enrollment of 20 patients suffering from end-stage biventricular heart failure. 70% of the patients in this first cohort reached the study’s primary endpoint, corresponding to six-month survival with the bioprosthesis or a successful heart transplant within 6 months after device implant. By comparison, this rate was only of 50% for the feasibility study and 54-62% for the only total artificial heart currently on the market. The data collected from the patients having achieved the study’s primary endpoint again confirm the biocompatibility of the CARMAT prosthesis, already proved during the feasibility study, and notably its positive safety profile, never before achieved by other technologies, with the absence of cerebrovascular accidents, gastrointestinal bleeding or infections due to the percutaneous cable. Furthermore, these patients only required light anticoagulant therapy. The device has moreover proven its ability to respond to changes in the patient’s physical effort by modifying the flow, confirming that the self-regulation system works correctly. Patient enrollment for the second part of the PIVOTAL study began in accordance with the protocol in September 2018 in international medical centers, under the guidance of Principal Investigator Prof. Ivan Netuka (Chair of the Department of Cardiovascular Surgery at the IKEM institute in Prague, Czech Republic) and Co-Principal Investigator Prof. Finn Gustafsson (Rigshospitalet, Copenhagen, Denmark). To date, the cumulative support time of the CARMAT heart within the framework of the PIVOTAL study has reached 5 years in the 11 implanted patients. This accumulated experience shows the ability of the CARMAT technology to provide a long-term solution for patients suffering from end-stage biventricular heart failure, along with a substantial improvement in their quality of life. The analysis of the collected data, representing over 20 years of cumulative operating between the clinical study and the reliability tests benches, has made it possible to identify aspects in which the manufacturing process could be improved, essentially concerning the control of the integrity of the prosthesis and the cleanliness of its technical compartment. The implementation of these corrective actions required the production – and therefore implants – to be suspended in the fourth quarter of 2018. Production has recently resumed and the new prostheses will be available from April. The Company is currently validating additional clinical centers in two more countries in order to rapidly complete the enrollment of the second patient cohort and submit the CE marking dossier in early 2020. The PIVOTAL clinical data represents the final element needing to be added to the CE marking dossier prior to its submission to the DEKRA notified body. Since the submission of an Investigational Device Exemption (IDE) application for an Early Feasibility Study (EFS) in 2018, CARMAT has been holding constructive talks with the FDA (Food & Drug Administration, the United States health authority). Significant progress has been made, and the file should be supplemented with biocompatibility tests on a certain number of prostheses currently in production. This enables CARMAT to envision – assuming the FDA validates our application – the launch of implants in American patients by the end of 2019. The selection of clinical centers and the formation of scientific committees are ongoing. drawdowns on the contingent equity lines subscribed to with Kepler Cheuvreux for a gross total of €0.9 million. Within the framework of this contract, CARMAT has access to an additional €24.2 million of financing that could be exercised depending on its requirements and on market conditions over the coming 36 months. Given the recent non-dilutive financing in the form of a €30 million loan granted by the European Investment Bank (EIB), CARMAT has the necessary financial resources to support its clinical and industrial developments and prepare the commercial phase.